Nothing smells quite like the holidays like a pie fresh from the oven. When that oven is guarded by Kaley Laird, pastry chef at The Rhu in Asheville, the aroma is irresistible. 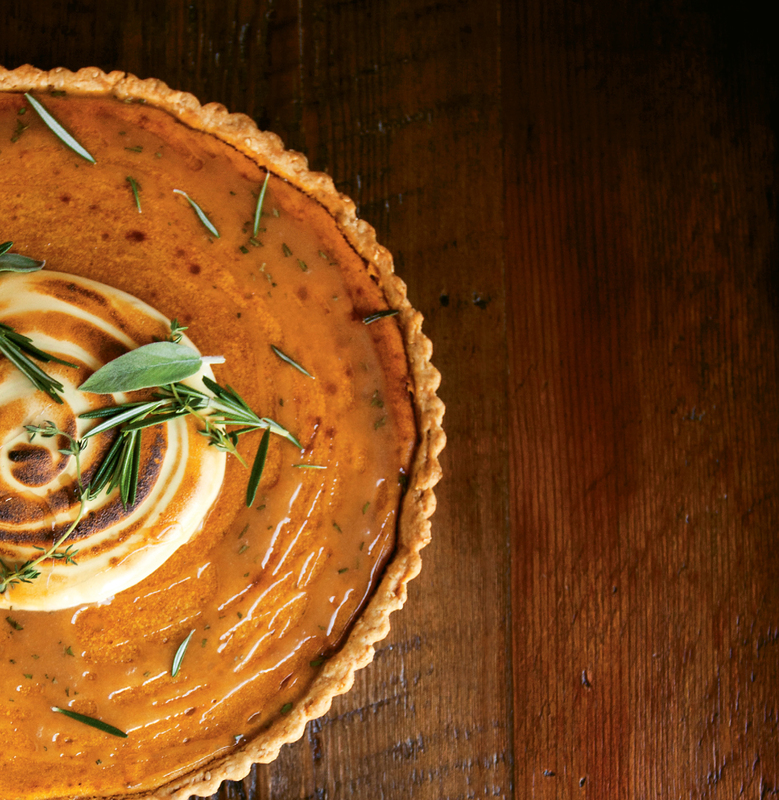 Her Roasted Sweet Potato Chess Pie features a bennecake flour crust, savory rosemary honey glaze, and a decadent sorghum marshmallow fluff topping. She describes the dessert as “comfort food” inspired by a traditional sweet potato pie. “It uses nice warming flavors of rosemary and herbs that trigger the sense of the holidays without cinnamon or spices,” she explains. Laird was recently a contestant on the Food Network show Chopped, an experience she says renewed her love for the food industry. Here in Asheville, she can be found making baked goods that put a fresh spin on Appalachian ingredients. For the pie crust (recipe here) she recommends Anson Mills bennecake flour for its Southern flavor. Preheat oven to 400°F. Lightly coat sweet potatoes in oil and salt. Roast until cooked completely and lightly caramelized, about 45 minutes. Let cool and remove skins. Purée in blender until smooth. Preheat oven to 325°F. In the blender with the sweet potatoes, add brown sugar, cornstarch, milk powder, salt, nutmeg, cinnamon, vinegar, cream, and egg yolks. Blend until smooth and well incorporated. Slowly stir butter into mixture. Pour into par-baked pie shell. Bake for 20 to 30 minutes until set, but not puffed or browned. It should have a gelatinous jiggle. Melt butter in a medium pot. Add brown sugar and honey, stirring until they begin to dissolve. Add remaining ingredients, stir, and bring to a low boil. Cook for five minutes and reserve. Using a mixer and whisk attachment, whip egg whites until they begin to foam. Add sorghum and corn syrup. Turn mixer to high and whip until mixture becomes white and marshmallow-like. Turn off and add powdered sugar. Slowly increase speed as sugar incorporates. Whip on full speed until incorporated and fluffy, then stir in salt. Reserve until needed. Top Roasted Sweet Potato Chess Pie with marshmallow fluff. Brown fluff with culinary torch before serving (optional).